However I’m not sure how I can expose it. Basically we want to just be able to call this endpoint and allow our external service developers to display the tracking information. Once you have created the site, if you need to expose it (unauthenticated) make sure that the new site has guest user access and the the profile has access to the apex class. 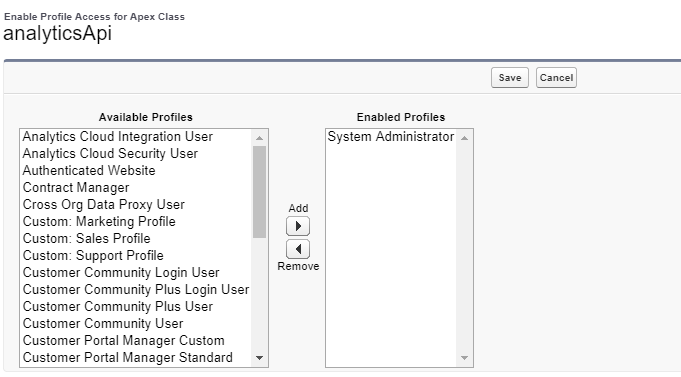 When you select an Apex class, it has a security setting to enable profile Access, you will have to add the guest site profile. The time you have written a web service class, it's now exposed. It's just how you need to call it. But before any external client can invoke your REST webservice, they need to authenticate themselves. And the way you authenticate to be able to consume any REST API, is using OAuth 2.0 where a token can be retrieved by setting up a Connected App. Refer to the documentation for more details on authentication. Once the client has authenticated themselves, they can invoke the GET method as in your API by using the below endpoint URL and passing the OAuth token. Not the answer you're looking for? Browse other questions tagged apex rest-api api rest or ask your own question. how to make call to apex rest api? Access to an external API using salesforce?